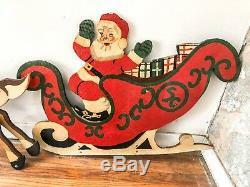 Vintage Santa Sleigh & Reindeer Christmas Yard Decoration, Hand Made Circa 1950's. Pressboard Construction, sealed with a satin-to semigloss clear coat. Reindeer (7) Indivual Pieces Rudoplh being one of them. 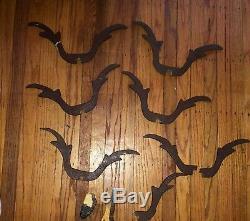 There are 6 sets of Antlers for 7 Reineer, Once of which is broken (easy fx). There are also 2 broken pices of hooves, (Also easy fix). There is a wooden support for the display not pictured. These were locate at my Great Grandmothers home. I can only tell you what we know about them which isn't very much. My grandfahter beleives they may have been made by Great Grandfather who's passed away. He'd be 103 years old now. He was a woodworking hobbiest with an artistic side. By all apperances they seem to be hand made. There is a noteable difference in scale between Santa and the reindeer, there is paint on the back from when the front was painted, not something that you'd expect to see in a produced decoration. I'm not an expert in antiques or vintage items. I'd be happy to hear from anyone who has factual info on items such as these and I'll update the lisitng accoringly. 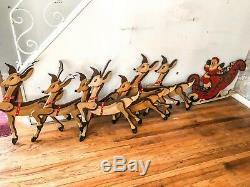 The item "Vintage Santa Sleigh & Reindeer Christmas Decoration, Hand Made Circa 1950's" is in sale since Saturday, February 9, 2019. 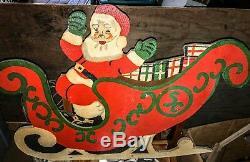 This item is in the category "Collectibles\Holiday & Seasonal\Christmas\ Modern (1946-90)\Other Modern Christmas". 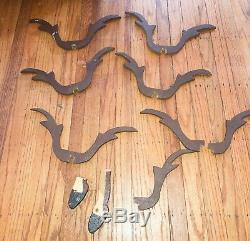 The seller is "justjake4515" and is located in Williamstown, New Jersey. This item can be shipped to United States.